Agave attenuata at Goleta Beach in Santa Barbara, CA. Agave are plants of the new world. Taxonomically the genus is grouped with other lily relatives that in the past were placed in family Liliaceae, then Amaryllidaceae and later in the Agavaceae, which currently also includes Beschorneria, Furcraea, Hesperaloe, Hesperoyucca, Polianthes and Yucca. Related plants such Sanseveria, Dracaea and Cordyline, once inclued in Agavaceae, are now in their own family the Dracaenaceae as are Phormium (Phormiaceae) and Doryanthes (Doryanthaceae). Nolina (including Beaucarnea), Calibanus, Dasylirion and Nolina are now put in the Noliniaceae. 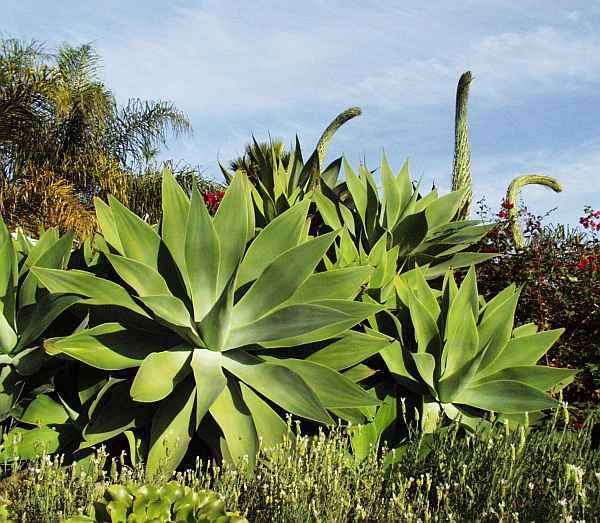 We have information on many of these plants on our Agave Relatives Page and Yucca Page. The name Agave, attributed to Linnaeas, is Greek for "noble", presumably for some of the species that are large stature and have bold structure. These noble plants are often listed as perennials but because most are monocarpic, meaning they bloom once in the life of the plant, the term "perennial" is somewhat misleading and more reasonably these plants might be considered "multiannuals". They are rosette forming plants with spirally arranged leaves that emerge from a center stem. The leaves vary in width, succulence, texture and color. Some have spines on the margins and/or tips while others are unarmed. Some are solitary growing while others produce offsets at their base or on short rhizomes. There are upwards of 200 species in the genus with a concentration of over 125 species that are from Mexico, 15 species within the boundaries of the United States and rest distributed through Central America and the Caribbean basin (including Venezuela in South America). San Marcos Growers grows a number of species and hybrids of Agave. We have selected these plants because they are showy and do particularly well in the mediterranean climate of coastal California. Agave we grow A descriptive list & images of agave grown at San Marcos Growers. Agave americana 'Picta' What to call those beautiful large variegated Agaves. Agave 'Blue Flame' This beautiful hybrid has bold lines but is gentle to the touch! Agave FO-076 Is the Agave Felipe Otero collected a form of Agave titanota? Agave hybrid This beautiful Agave was found in a Santa Barbara Garden. Agave 'Rosa Gorda' This interesting small Agave that forms mounds of small gray rosettes is flowering in a Santa Barbara garden. Agave salmiana 'Medio Picta' A stunning Agave but some question whether it a Agave salmaiana or Agave americana cultivar - we think it is Agave salmaiana. Desert Botanic Agave Tips The Desert Botanic Garden in Phoenix, Arizona put together these tips for desert agave growers. Desert Tropicals Website This Phoenix based website was created by Philippe & Sura Faucon - great information on lots of plants! ISI Agave introductions International Succulent Introductions at the Huntington Botanic Garden has introduced several great agave. Yahoo AgaveForum Group This group is a great reference for agave information & for meeting other agave enthusiasts. Yahoo Agavaceae Forum Another Agave group that is a great reference area for agave information. Lotusland Garden Tour Take a tour through the the fabled Lotusland Botanic Garden.